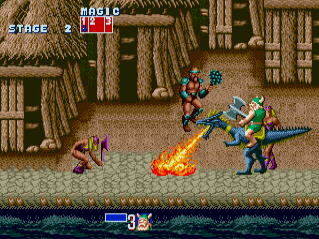 Insomniac's Dream Sequence: GOLDEN AXE COMETH! Golden Axe has arrived at the Xbox Live Arcade! I had to call my friend Saru to share my incredible joy and excitement at this title hitting my home console as soon as I can race home to download it. Back in the mists of time, during my childhood in Berryville, we would often venture to Winchester’s mall which contained the Dream Machine. The arcade. And in that arcade I played primarily three things. I played that game endlessly because if you won, you could keep playing until you lost. So I’d use my last quarter or two to keep myself occupied until my mother had finished shopping, or just to see how long I could keep playing. I love skill cranes. I play them everywhere I go. I used to be able to walk up to a machine, scan its contents and decide if anything was attainable within moments. I would often stalk machines, watching the poor souls throwing their tokens away in vain, and the moment they walked away, I would pounce. And withdrawal every conceivably grabbable item from it. To this day, I am still drawn to the machines in stores and malls and random country stores. And I still feel the lusting to win stuffed animals and give them away to random children. I once walked out with a half dozen in an hour stretch and decided I had to stop keeping all of them. And now we get to the crowning achievement of my arcading experience. I love this game. I’d play it for hours. Riding dragons, hacking and slashing my way through the levels with my allies of whoever happened to jump on with me. I remember many, many hours of fondly trying to make it through the game and hoping I would find an ally to help me from being slaughtered. And now, it’s coming to the Xbox Live Arcade! TODAY! As soon as I get home it will be available to play! I can’t wait. Is it obvious?